Enduro Star TS3 Trail Stand ... lift your motorcycle to lube the chain or fix a flat when away from your garage! Light weight and packable!  The Enduro Star TS3 Trail Stand is an effective way to lift the rear wheel of a motorcycle for tasks such as chain lubrication, fixing a flat and when other short term maintenance or repairs are necessary. 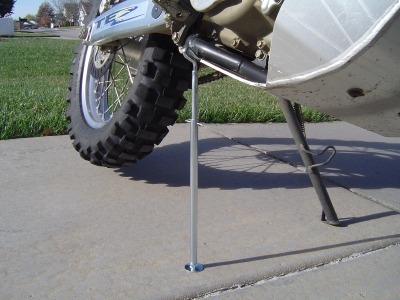  The Trail Stand supplies a third point of support replacing one of the wheels on a motorcycle equipped with only a factory installed sidestand, and on it can be used on motorcycles with center stands to keep the front wheel in the air for fixing a flat.  It can also be used on some motorcycles to lift the front wheel if an appropriate point on the front or right side of a skidplate is available. Varying motorcycle geometry may make front wheel lifting impractical on some motorcycles but it can be accomplished on many models if a 3/8" diameter hole (or larger) is located on the right front or side of a skidplate. 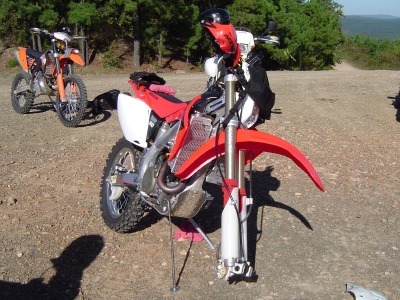  The Trail Stand can easily be packed on your motorcycle for use on the road or trail. It fits in any space that will accomodate the 10-1/8" long tube and rod assembly, such as a tailbag or fenderbag . Since the cradle and foot are removable, it allows for the Trail Stand to be easily stored for use when you need it most! Or if you have more room it can be stored assembled ready for quick use.  The Trail Stand comes with a hook & loop strap to lock the front brake lever on any bike when lifting the rear wheel. And on some motorcycles it can be used to lock the rear brake by holding the rear brake pedal down when wrapped around the frame or other suitable point.  The Trail Stand adjusts from 11-1/2" up to 20" in height, and is constructed entirely of steel and zinc plated for durability and years of reliable service! 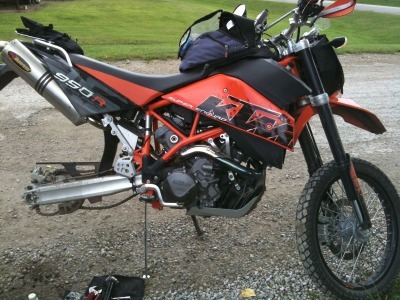  This makes the Trail Stand the best stand to lift dual sport motorcycles such as a WR250R, KLX250, DR-Z400, DR650, KLR650, XL650, TE610 and other models, even the KTM 950 Super Enduro! It is the only stand we know of that can be stored in such a small space and still lift the very tall 950 Super Enduro!